The cast of The Shield at the 2004 Season 3 premiere. Michael Chiklis and the rest of The Shield gang got together for one epic reunion this past week. The stars of the FX series, which ran from 2002 to 2008 convened upon the 10-year anniversary of the show's finale season. Posing for a set of group photos and selfies, Chiklis was joined by series creator Shawn Ryan and fellow actors Walton Goggins, Kenny Johnson, CCH Pounder, Benito Martinez, Catherine Dent, David Rees Snell, Jay Karnes, Cathy Chalin Ryan, Davis Marciano, and Paula Garces. The Best on the Beat: Matt Roush ranks the five best-ever cop shows! Known as one of TV's main anti-heroes, Chiklis played Vic Mackey, leader of the Strike Team in the Los Angeles Police Department, and the part earned him both Emmy and Golden Globe Awards. Despite it being over 15 years since the show's premiere it's clear that this crew is still pretty close. In the photos below — shared by Chiklis via his Instagram page — see as they gather together in an exciting moment for fans of the series. "Old friends together like time has stood still. Such incredible chemistry. 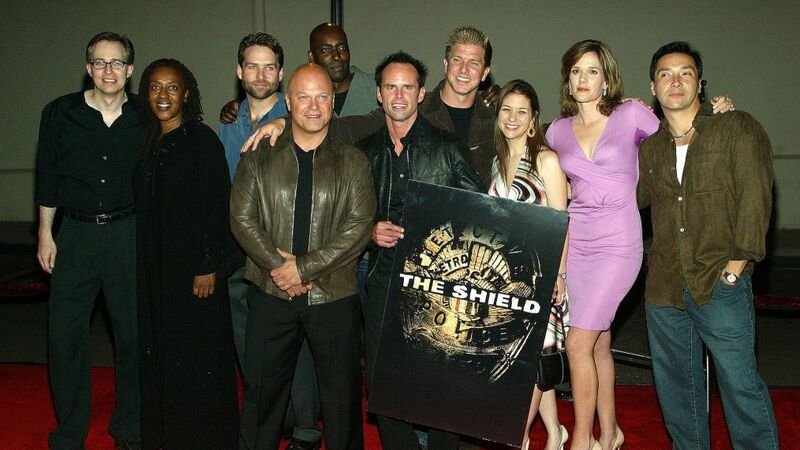 #goodtimes #shieldreunion," Chiklis captioned a group photo. The actor also shared a separate photo on his Instagram page with Walton Goggins and Kenneth Johnson writing, "These two friggin guys! Good lord I’m a fortunate man. #goodtimes #shieldreunion #brothers." Of course Chiklis isn't the only one who captured these moments during the sweet reunion, his costars also got in on the fun sharing videos and photos on their own accounts, scroll down to see more. And even though actor Goggins didn't share any photos from the day, a previous post with Chiklis in July proves how tightly knit this group is. "17 years and counting... I love you man. A Pillar you have been a Pillar you will always be. @michaelchiklis," he captioned a photo of he and The Shield's leading man. With all the news of reboots and revivals, could a reunion like this spark some future trials and tribulations for the characters in The Shield? Surely fans would hope so, but for now it's good to see this team still sticks together.